We’d love your help. Let us know what’s wrong with this preview of Long Shot by David Mack. Like so many Star Trek novels, it is a love of the characters that really makes this story shine. David Mack has created a group dynamic that is a hell of a lot of fun to read. Combined with a fun, high-stakes adventure, Long Shot makes for a great read. I'm very interested to see where these characters go in the future, and where certain relationships will end up. Some great character development for the small crew of the Sagittarius gives me a lot of hope for the future of Seekers. With an alre Like so many Star Trek novels, it is a love of the characters that really makes this story shine. David Mack has created a group dynamic that is a hell of a lot of fun to read. Combined with a fun, high-stakes adventure, Long Shot makes for a great read. I'm very interested to see where these characters go in the future, and where certain relationships will end up. Some great character development for the small crew of the Sagittarius gives me a lot of hope for the future of Seekers. With an already-excellent year in Trek lit to this point, it is no small praise to say that Long Shot is my favorite novel of the year so far. The continuing voyages of Scout Ship Sagittarius. I have really enjoyed David Mack's Star Trek books, especially the Vanguard and Seekers series. The story involves a science experiment gone wrong, and a request for help. The story is engaging and there is a lot of character development as we get to learn more about this crew. The book is fast paced and an enjoyable read. Well, this is a rip roaring science fiction adventure that jumps from one adrenaline pumping scene to the next. My only complaints are the lack of ideological discussions inherent with "Star Trek", and that there are several things which occur in the book simply to make the book longer without really adding anything to it (other than pages that is). Phew! This book was terrible. But I also really really enjoyed it. Given that I picked it up for a quid I the charity shop, not a bad buy. If you're the kind of star trek fan who enjoys the terrible episodes where you shout at the corny plot and laugh at the wobbly sets, then you'll probably get a kick out of this. 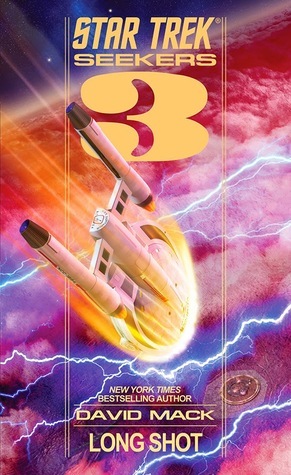 Star Trek: Seekers: #3 Long Shot by David Mack Yes, I picked up book 3 even though I was more than a little underwhelmed by the first Sagittarius story. The story itself dragged on a bit too long. It felt more like a SCE-story: alien culture experiments with technology they don't quite understand (either they come up with the theory themselves or get it from alien cultures or find it lying around), it goes boom and Starfleet miracle workers have to resuce everyone. There were funny little tidbit Star Trek: Seekers: #3 Long Shot by David Mack Yes, I picked up book 3 even though I was more than a little underwhelmed by the first Sagittarius story. The story itself dragged on a bit too long. It felt more like a SCE-story: alien culture experiments with technology they don't quite understand (either they come up with the theory themselves or get it from alien cultures or find it lying around), it goes boom and Starfleet miracle workers have to resuce everyone. There were funny little tidbits such as the fact that the sentient race on the planet of the week appeared to be frog-like, their civilization on a technical level like ours in the 21st century, perhaps a bit more advanced with funny allusions to budget cuts (leading to disaster, of course) etc. Loved the way they looked upon the Sagittarius-crew - apparently humans ressemble the primate species on their planet. And I liked the way the Prime Directive was rendered a moot point right at the beginning - although landing on the planet and then wondering why anyone got that landing on tape was a bit much. But again, all the side catastrophes, rescue operations of space stations etc aside... I've read that plot a bit too often already for it to come across as particularly engaging or novel. What bothered me a bit was the attitude of the main researcher - he screwed up royally and keeps criticizing every one of Ilucci's ideas to save his planet? Whether quietly dropped or hint at future encounters: Dastin is tasked to look in the database whether the technology comes from a known species - the matter is never resolved in this book. The characters still seem a bit too caricature-like - witty one-liners (although sometimes a bit outdated because is there something like a warranty or money back guarantee in the 23rd century?) are par for the course, but overall the protagonists come across as more sympathetic and real. There are some conflicts within the crew, like with Dastin (a gay Trill) or Taryl (an Orion female, but without the sexual pheromones), even though I don't quite see why Theriault who I still don't see as first officer material has so many issues with particularly Dastin. Of course, he has a cocky attitude, but is he really more insubordinate in his one-liners than eveyone else on board Sagittarius? Or is it because he apparently has the same taste in men as Theriault? Liked Torvin's innocence and his wearing his emotions on his sleeve - and I'm looking forward to seeing more of him and Taryl, the world-weary misanthrope. I still think that this part of Seekers (as opposed to the Endeavour) needs quite a bit of work. There are technical questions surrounding the Sagittarius - like the fact that only 14 people man this ship which would render longer missions quite impossible. But as established in Vanguard, the Taurus Reach is a vast section of space - so how exactly does the deployment of the Sagittarius work? Do they have downtime since there are practically only 2 shifts on board? Or are they just constantly overworked and overly tired (i.e. does Mack hope no one notices things like that?) And what the hell: there's only room for 8 people in the evacuation buoy? The same applies to the characters: I really enjoy Torvin, I like Dastin - maybe because of his clashes with Theriault who just rubs me wrong - and Razka, I'm leaning towards Terrell, Sorak and Taryl, and am indifferent towards everyone else. And I certainly don't care about that non-com, enlisted personnell or officer stuff. I never belonged to any kind of military hierarchy, and I certainly don't plan to in the future. And I don't understand why it's such an issue on this ship that it has to be mentionned on every other page whether someone is enlisted or not. This review has been hidden because it contains spoilers. To view it, click here. This book took me a long time to grow warm with the story. For one thing Mack is really enamored to spicking the text with pop culture references and only slightly changed current idioms put into the mouth of people from the future or completely different cultures, which never really striked me as fitting another bit was that the plot device of the red herring causing an improbability field led to a steeply escalating curve of ever more ridiculous situations and constant throwbacks to the overwo This book took me a long time to grow warm with the story. For one thing Mack is really enamored to spicking the text with pop culture references and only slightly changed current idioms put into the mouth of people from the future or completely different cultures, which never really striked me as fitting another bit was that the plot device of the red herring causing an improbability field led to a steeply escalating curve of ever more ridiculous situations and constant throwbacks to the overworked crew of SAGITTARIUS. But then the situation turned towards a solution for the problem and it could switch towards more character based writing and i got hooked again. Having only 14 members of crew helps a lot to get them all pretty good exposure during the different catastrophic failures and life threatening disasters and with the slight exception of the already mentioned overreliance on "present day like" slang the figures soon grow close to your heart. There's a thing going on between First Officer Vanessa Theriault and the Trill Dastin, but it gets only a few appearances so it can't grow into a real annoyance, future books about the ship hopefully won't expand on this whatever it is... rivalry? Hatred? A mating ritual gone awfully wrong? And if they do include it, please no more in times of peak stress levels like during the emergency landing of the SAGITTARIUS during the book's climax. Enjoyable and well-written, if a bit predictable in the way problems resisted solution until there had been close to 300 pages of story. Took a little to get up to speed and realize we had moved on to another adventure. Once that settles in the pace is great and enjoyed all the way through. Looking forward to the next in the series. Good story . Interesting kept me guessing how it was going to turn out . Would have been nice to see the enterprise come to the rescue though . Good book love the continuity I think the native populations planet and technology had too many similarities to earth overall very good! Not bad at all, but for some reason I just didn't get into it as much as I usually do Mack's ST novels. I just don't like the crew that much.